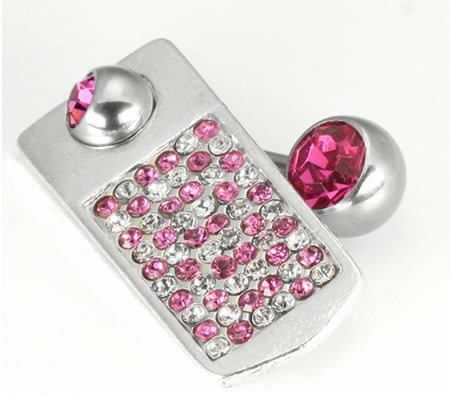 14g 7/16" Crystal Explosion Going Up Pink Navel Shield 316L Stainless Steel Shaft with 6mm and 8mm Gem Ball. Shield measures 10mm wide and 25mm tall. Each crystal is set by hand, so each piece of jewelry will be slightly different. The glue is not affected by hot or cold temperatures and is fully waterproof which allows these items to be sterilized without causing any damage to the crystal sets. The Shield is removable. You can put this shield on any navel jewelry you have might have.